Using natural plant oils to look after your skin during the menopause. All women go through it. After decades of dealing with the fertility, periods, and monthly skin turbulence, the menopause brings with it some potent dramas of its own. Until now, the menopause hasn’t really been talked about. It was something women were supposed to go through with stoicism and silence, even though many struggle and are confused about what’s happening to their bodies, their metabolism and their appearance. It can be a time of real trauma, and it can feel as if the ageing button has been fast-forwarded which is difficult in cultures where youthful appearance is highly valued. The ovaries ceasing to function has an impact on all aspects of your health. The ovaries produce oestrogen which is essential for many metabolic functions. Falling oestrogen levels are mirrored by falling collagen levels, and collagen is what you need for hydrated, young-looking skin. Loss of collagen is rapid in the first two years after menopause, and 30% of collagen is lost in the first five years after it. As oestrogen falls, the ratio between your oestrogen and testosterone levels is also affected, and the changing ratio can be responsible for hair thinning or loss, and the emergence of oiliness or even acne. The epidermis thins and becomes less elastic, and the skin’s barrier function falters. Your face, and the back of your hands, lose moisture, collagen and fat. Your skin loses its structure, causing wrinkles, sagging and fine lines. 26% of menopausal women also develop an under-active thyroid – hypothyroidism – which means their metabolism slows and can result in weight gain, reduced sweating, and increasingly dry and flaky skin. The stress hormone cortisol rises because your menopausal body produces more of it, and high levels of cortisol trigger inflammation which further breaks down collagen and results in thinner skin and dryness and redness. Lack of sleep – caused by hot flushes and night sweats – can change hormone levels and metabolic rate in the same way that ageing does, and so the menopause can speed up cellular ageing. Skin can become increasingly sensitive because skin repair slows down while ageing processes are accelerated. Hyaluronic acid levels drop, so skin can lose its glow and elasticity. The ceramides that act as bonders and binders in the skin’s mantle deteriorate, and the skin’s surface becomes drier, flakier, and more irritated and prone to redness. Age spots can become more noticeable, and also the lines around the eyes and mouth. The lack of collagen causes skin to sag, especially around the jawline. So far so depressing…. but it doesn’t have to be. There are lots of ways to combat the impact of the menopause – cardiac exercise, weight-bearing workouts, healthy eating, yoga, meditation, supplements to name a few – and great skincare can also go a long way to keeping your skin healthy, hydrated and glowing through these challenging years. Here’s how Votary is best placed to help. All of our natural products are relevant for menopausal skin struggles. Their format, first of all, is crucial. Lots of women find that their skin becomes dry and water-shy at this time. Using a foam or gel cleanser can strip moisture away, aggravating the problem and triggering your skin into a stressed, cyclical reaction. Oil cleansers are different because they work with the skin, whisking away make-up, environmental toxins and SPF and leaving your skin feeling soft, supple and totally clean. Any of the Votary cleansing oils will help you to have the first step to healthy, comfortable skin. Our original hero Rose Geranium and Apricot Cleansing Oil works beautifully to clean skin thoroughly and leave it feeling comfortable and plumped up. For those who want a little gentle exfoliation, the Clarifying Cleansing Oil contains soothing rice bran and oat bran oils which work to gently lift away congested skin, helping to avoid breakouts. Rosemary and bergamot work to combat any oiliness triggered by testosterone ratios, resulting in calm, re-set, balanced skin. If redness and dryness is an issue, our Super Seed Cleansing Oil is packed with the goodness of twenty two seed oils and is perfect for skin that has been over-sensitised by hormonal issues. Thicker and richer than the other options, it’s blissfully soothing for stressed, ultra-sensitive skin. Once your skin is properly clean, you can start to tackle other issues. Our Lemon and Neroli Toning Serum combines the benefits of a toner and a serum, and it’s particularly good for menopausal skin. It contains glycolic acid which works to firm, smooth and hydrate, and is brilliant at tackling age spots and dry, rough skin. It works to even out skin tone and reduce pore size and it’s also a real tonic for the decolletage. It’s also packed with hyaluronic acid so it addresses your own skin’s falling levels and helps to plump them back up to give you added density and glow. If your oestrogen/testosterone ratios have given you breakouts, our Blemish Rescue Oil harnesses the power of tamunu oil and salicylic acid to softly calm and heal without causing additional dryness and flakiness. And now to hydration. All of our facial oils are crammed with potent, natural goodness which can boost, moisturise and strengthen your skin. In particular, our Super Seed Facial Oil is excellent for feeding and deeply nourishing your skin. If you want to layer and lock -in even more hydration, our Super Seed Nutrient Cream can applied on top of any of our oils for a protective moisture boost. However, if you really want to target ageing skin, our Intense Night Oil is the one to reach for. It has been formulated to help you address the cause of the problem – collagen. It contains a natural, oil soluble form of retinol. Retinol is derived from Vitamin A and works to re-stimulate and build collagen production. While you sleep, our Intense Night Oil works to improves your skin’s plumpness, resilience and elasticity so that you wake to a restored you. 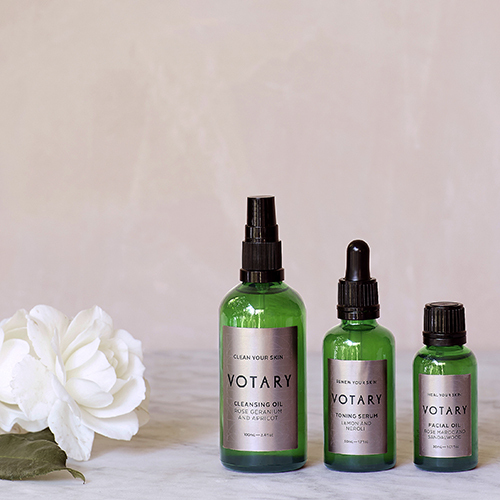 The Votary cleansing routine is a moment of tranquillity and self care in your day. Our facial oils, and our face to facecloth ritual, work to soothe, calm and uplift. If sleeping is an issue, try our relaxing, soporific lavender and chamomile Pillow Spray which is infused with calming essential oils to help you on your way to restorative, boosting sleep. If your limbs feel dry and uncomfortable, our Hydrating Body Oil and Body Treatment Oil can restore lustrous, glossy smoothness to your skin. My top tip is to apply them to damp skin to hydrate even more deeply. I’m proud that the whole of the Votary range can help with menopausal skin issues. Healthy skin can be beautiful, radiant skin, and all of our range is designed to achieve that. The menopause is a rite of passage, and Votary can help you glow through it. I am 72 years old. My skin is fairly smooth considering my age. I am looking for one product that I can use day and night to hydrate the skin – cannot afford several products. Your recommendation please. I think that the Super Seed Facial Oil will do a brilliant job of hydrating and nourishing your skin in a simple and wholesome way. If you prefer to use a cream, then the Super Seed Facial Cream. We’d love to know what you think. Best wishes, the Votary team.